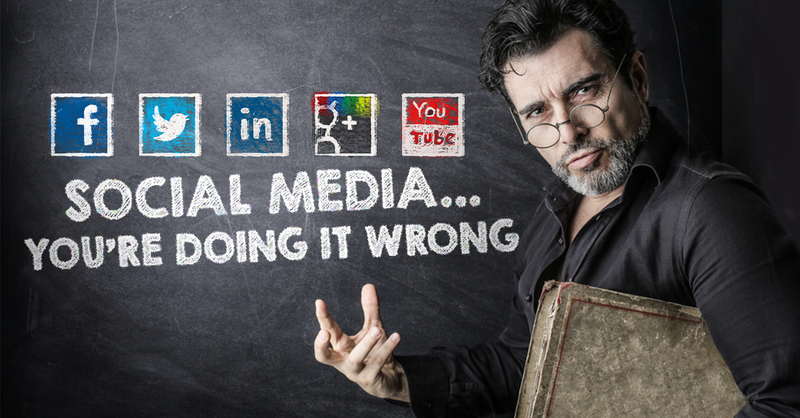 There isn’t a strict formula or set of rules on how you use social media, but there are certain things that you should NOT be doing. If you’re doing any of these things, you’re doing it wrong. 1. Posting content only you care about. Your audience likes you, but they really like your brand. Don’t mistake your business page as a personal profile. This means sometimes you may have to post content that you don’t like, but you know your customers will. 2. Posting content at the wrong times. 3. Trying to sell your products and/or services. Be social and talk with your audience about news, tips and other information regarding your industry. DO NOT post just to sell something… you’re going to lose attention very quickly if you do. Be social… have a personality! 4. Not using images and other visuals. We could start listing statistics on why posts with images have more engagement, but, honestly, that’s something we’ve all heard about now (well, if you’ve been listening – see next tip). Content is king. Take our word on this one…include images and videos with your posts. 5. Not listening and engaging. You can update your social media channels every day, but there’s no value if you’re not building relationships from your efforts. If someone comments on your post, comment back. If a brand or industry influencer follows you, thank them for following you. Learn to use programs that will help you listen to your audience. 7. Living in 1990 during 2014. Social media eats, sleeps, and breathes on trends and current news. While “On this date in 1991”, may work sometimes, your audience really cares about what’s happening right now. So the next time you go to update your Facebook status, post a tweet on Twitter or pin to a Pinterest board, please keep these tips in mind. #AndStopHashtaggingEverythingAlready. « Let’s Talk Twitter: Stop Tweeting Boring Sh*t!